A one of a kind, luxurious yacht. The Predator 92 is a resounding success every summer and perfectly fulfils the requirements of her guests. 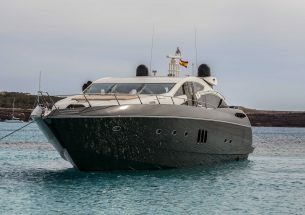 Her power, her luxurious amenities, her attentive and professional crew, very familiar with the best beaches and creeks of Ibiza and Formentera will make you live unforgettable moments, whether for a day or for a week cruise. 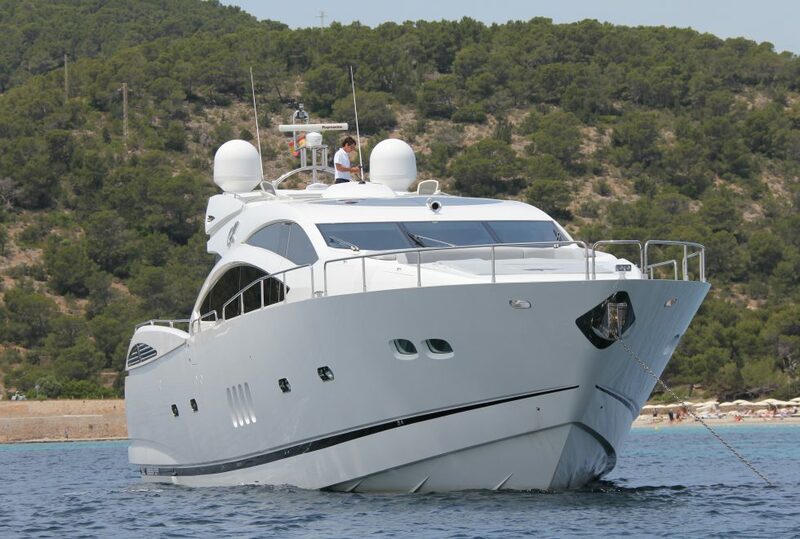 With superb interiors and huge deck spaces to cruise Ibiza in style. She has a total of 4 cabins; 1 Master, 1 VIP, 2 Twins with 2 beds (which can convert to a double). Foredeck with dining area for 6 people and sunbathing area for 8 people with removable bimini. Rear deck with dining area for 8/10 pax and sunbathing for 5/6 pax. The spacious galley is extremely well equipped, allowing the chef to prepare elaborate menus even when the boat is at anchor. 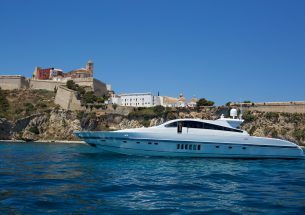 Moored at the prestigious harbour ‘Marina IBIZA’, with the famous Lio Cabaret Restaurant and close to many boutiques. This yacht will transport you to a new world, one which you will not want to leave. The price includes crew, mooring in base port, tableware and kitchenware, towels, aperitif prepared by the chef, fruits, appetisers, tea, coffee, soft drinks, some beers and wine. 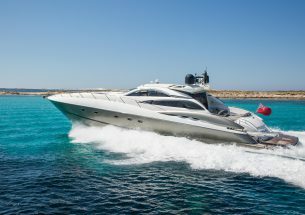 The price does not include fuel, mooring out of base port, taxes (IVA 21%), jet ski, special requests of spirits, alcohols, champagne, or meals on board. For a day charter, a security deposit of 20% of the rate will be required by credit card (Visa or Mastercard). For a week charter an APA of 30% of the rate will be required for fuel, food, and drinks. At the end of the charter the difference will be refunded (or charged) depending on fuel consumption.